I have always been drawn to bare brick walls and the rough, industrial feel they give a space. I have yet to live in a place with a wall like this, unfortunately my little sister has beat me too it and found herself an amazing apartment in Shoreditch, London with one just like this!! Funnily enough she has even decked out her place with crates like in the photo below. Except she has used them to make a coffee table. 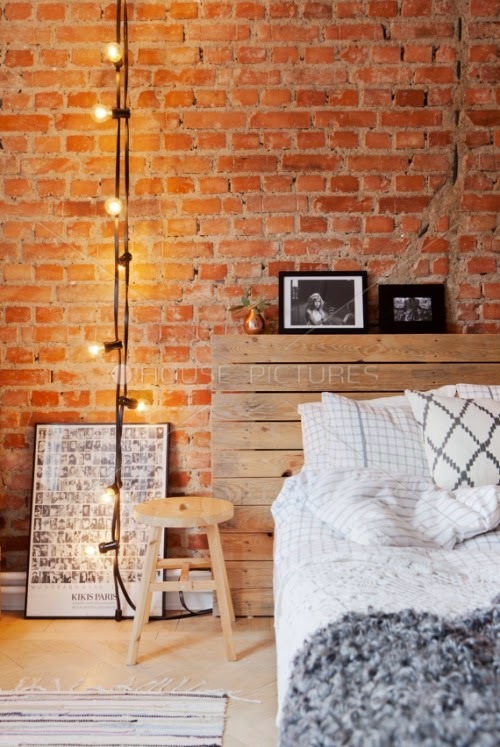 Proof that bare bricks and raw wood go together pretty well, and teamed with another favourite of mine- circus string lights.